Experience Washington dressed in her best jewel. Lets us show you the magic of the monuments and memorials splendidly illuminated by moon light. This tour uses our state of the art Bluetooth earpieces so that you are free to roam the sites as you wish to snap photos and adventure freely while you still hear the tour-guide's commentary simultaneously. Travel comfortably throughout D.C. on our spacious buses while our guide educates you on the rich history. We will provide you with LED bracelets that will allow you to roam free and alert you when it's time to re-group at the bus. This tour uses our state of the art Bluetooth earpieces so that you are free to roam the sites as you wish to snap photos and adventure freely while you still hear the tour-guide's commentary simultaneously. 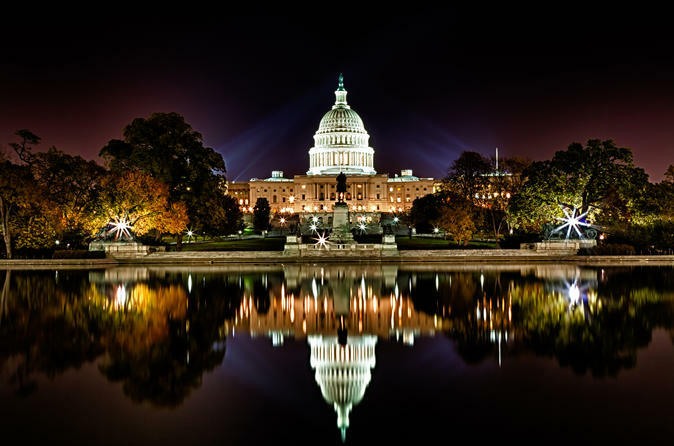 If you are tired and don't want to get off the vehicle then don't worry because we have plenty of video materials of Washington DC that you can enjoy right from your bus seat.